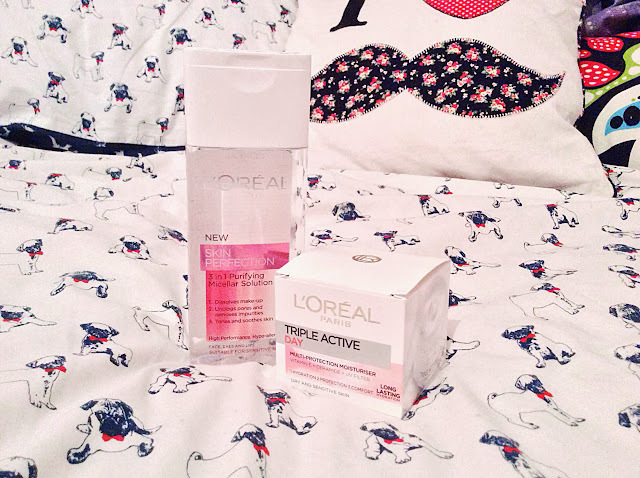 Just before Christmas I bought the L'Oreal Skin Perfection 3 in 1 Purifying Micellar Solution and L'Oreal Triple Active Day Moisturiser in one of those Christmas sets they called the Post-Party Beauty SOS Kit! I thought it was a great gift set and something I'd been wanting to try out. Noticing that it was £10 together and more expensive separately, I bought the set there and then. Just as a little heads up - it is currently £5 online! Firstly the Skin Perfection 3 in 1 Puryfying Micellar Solution boasts about its 3 uses: removing make up, unclogging pores and skin toning, whilst the Triple Active Day Moisturiser offers hydration, protection and comfort. I've been using this about 2 weeks now and Ive been using them both everyday in the morning, and the Micellar Solution again in the evening to remove my make up from the day and I'm happy to say that I've received positive results from them both! With the Micellar Solution I've noticed my pores visibly reduced and my skin a little tighter than it used to be. I'm the sort to forget skin care for a few weeks when I'm losing my enthusiasm, but seeing the results of this, I dare not let my skin care slip! I apply it onto a cotton pad, remove and repeat until my face is completely clean of make up. I use about 2-3 pads and the only complaint I have is that it spills out a little too quickly from the bottle. I find myself racing the liquid, and either getting not enough product, or way too much and it's spilling down my arm. I love this cleanser and it works just as well as the Bioderma H2O Sensibio, as well as being widely available, but if I were to buy it again I would have to invest in one of those make up remover pump dispensers to keep that I'm control, which isn't a bad idea. I noticed yesterday that I'm running very low already, which I wasnt too happy about. As for the moisturiser, I use this every morning before applying my make up and is really comfortable once applied, as well as throughout the day. It doesn't feel caked on or slippery, but as if it sinks into the skin instantly for that soft hydrated feel in seconds. Over the last few weeks I've definitely felt that my skin feels a lot more hydrated and awake, especially as I'm prone to dry and tired skin. I've tried lots of moisturisers but never felt that noticeable difference until this one. It seems perfect for me! Using both these products over the last few weeks, I can honestly say that I've noticed my skin to be visibly more hydrated, as well as feeling it too. I've also noticed that my pores have got significantly smaller, as I have quite large pores and that my skin feels a lot tighter and looks a lot healthier. If you'd asked me whether I would buy both of these again, I'd say I would. I love the formula for both of them and what they do to my skin is just what I need. I would have to buy a make up remover pump dispenser, but that's not biggie when you're going to be using it everyday. I have some money to spend on amazon so it may be a little treat to myself! I was always interested in the L'Oreal Skin Perfection range when it was first released too, so there are more products of theirs I would like to try too like the Magic Touch Instant Blur, Awakening + Correcting Eye Cream and the Cleansing Milk. Have you tried anything from the L'Oreal Skin perfection range! Let me know, and link me to your reviews!